This is an old faithful tahini ball recipe that I’ve just revisited after not making them for quite a long time! These are a great substitute when you are having a chocolate craving – but I always use a mix of half raw cacao powder and half organic carob powder to balance them out so that they aren’t too stimulating. For those of you who are like me and are a bit of a “Kitchen Klutz” you can’t go too far wrong with these balls – and you can add whatever superfoods you like into them – they are very satisfying, and they’re healthy!! The ingredient amounts are up to you – what I’ve put down below is a very rough estimate – just play as you go along and add more of whatever is required to get the right consistency for rolling into balls. • Add in 2 x tablespoons of either raw organic carob or raw organic cacao powder or both! If the consistency isn’t quite right to roll into balls at this stage (they will be very sticky! ), add in some almond meal to help them hold together. 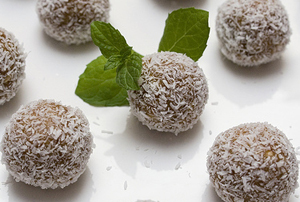 Roll into balls and roll in desiccated coconut (organic, sulphur free please! ), and then freeze. I love these!! I remember you making them at a retreat I attended with you years ago and they are still one of my ‘go to’ treats! Great to see you haven’t forgotten them either! They were very good, but it took much longer than 20min to make. I rolled them into much smaller balls and got more than 50. but even if I had done the larger balls, it would have taken about 40min to pulse everything and roll. Dusting them in chocolate might be nice, too. Previous post: Morning Munch! Best Breakfast EVER!